The Document Set Welcome Page is a Web Part page and you can modify it just as you would edit any Web Part page. You can customize the Welcome Page that appears for a Document Set so that it includes information that is useful to the people who will be working on documents within the Document Set. For example, you can display links to reference materials or style guidelines, project deadlines, or other information or data. Each instance of a Document Set created from a Document Set content type will display the same Welcome Page. The Welcome Page for a Document Set includes two Web Parts that are unique to Document Sets. 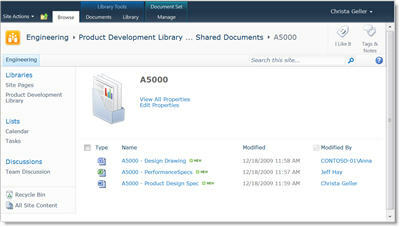 The Document Set Properties Web Part displays property information for the Document Set. The Document Set Contents Web Part displays the files that belong to the Document Set. If you customize the Welcome Page for the Document Set, you will probably want to retain these Web Parts. Note: If you are using SharePoint 2010, under Galleries, click Site content types. On the Site Content Types page, click the name of the Document Set content type you want to configure. Under Settings, click Document Set settings. In the Welcome Page section, click Customize the Welcome Page. In the window that opens, click the Site Actions menu, and then click Edit page. Edit the page just as you would edit any Web Part page. When you have finished updating the Welcome Page, return to the Document Set Settings page. In the Welcome Page section, specify whether you want to update the Welcome Page for any content types that inherit from this content type. In the Update List and Site Content Types section, specify where you want to update all content types inheriting from this content type.